First, here's a look at the Scratch wraps I used! 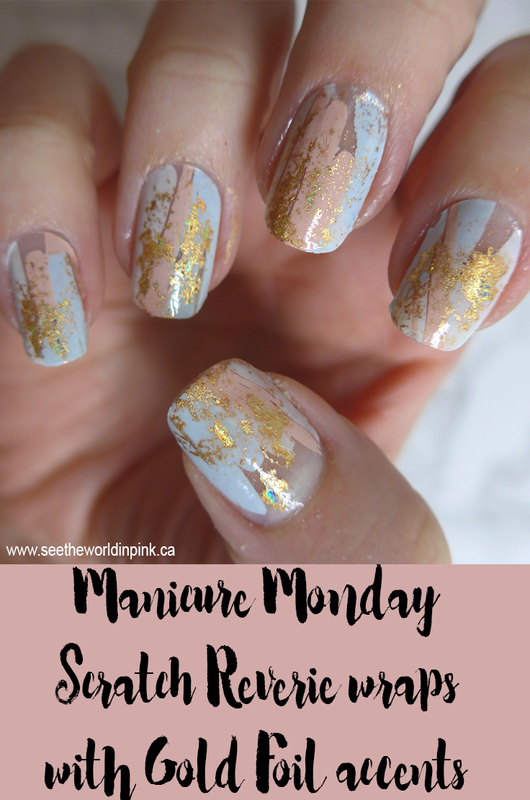 These are the Reverie style from the October Monthly Mani Kit, and they add the perfect amount of negative space - I don't think I could handle much more of my nail showing through! I've raved about these wraps before; they are by far my favorite nail wraps! While these wraps are pretty, I did think they needed a little pizzazz - so that's when I thought I'd finally use a product that has been in my collection for years untouched - foil! So, these foils really have sat around for years in my collection, really because I wasn't sure how to use them! So, I just decided to wing it! Staring with my base nail, I haphazardly applied the Foil Fix glue and let it dry down to clear, then apply the back of the foil colour you want on the nail and tap away. Then lift up the foil and apply until you like the amount! Then, finish everything off with a top coat! I love the finish the gold foil gives, and I think it was the perfect touch to these wraps! This is so fun this month doing nails we wouldn't normally do - I love the idea of trying something different! So, make sure you check out Cosmetic Proof, Prairie Beauty Love, and Tea & Nail Polish to see more "Nails We Wouldn't Normally Do"! Even though they're totally different, I feel like our nails this week are super similar as well! 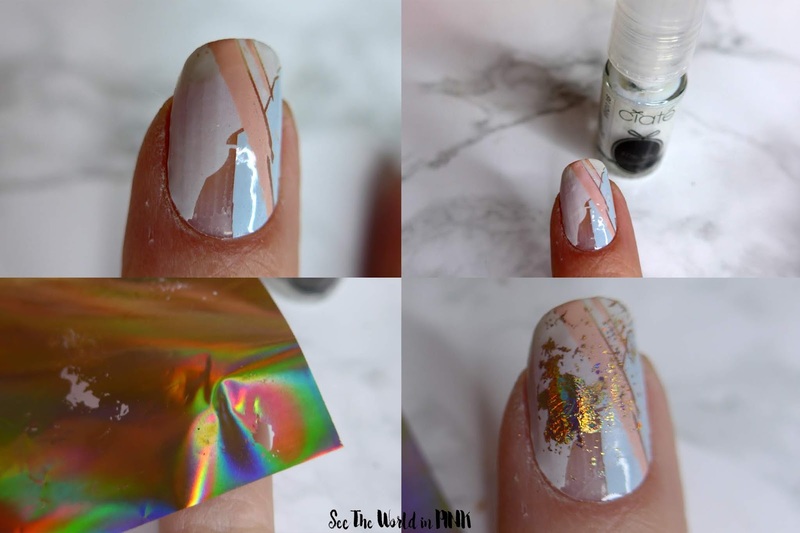 I've never tried wraps or foils before, and I'm completely with you on the discomfort of negative space nails, but this looks great! Ooooh - loved yours too. It's been so fun trying new stuff! I could not have had anymore negative space than this! I love how they turned out! I've never used foil before, but I have some sitting at home. May have to take it eventually. Thank you! My foil has been sitting there for years waiting to be used and I liked it!